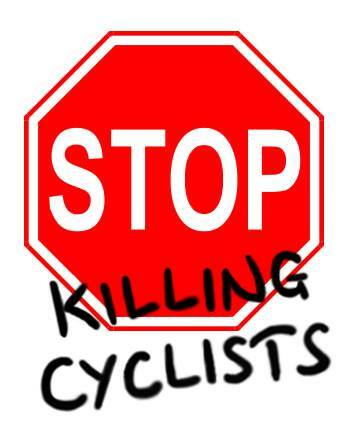 Stop Killing Cyclists will stage a Vigil and Die-In on Monday, 26 January 2015 at 18:00 (for 18:30) at the Amhurst Park Junction with Seven Sisters Road, N16, in memory of the cyclist who was crushed under the wheels of an HGV at 8am on Tuesday, 20 January 2015. She was the 13th cyclist to be killed in the UK in 2015 (a list can be found at: UK CYCLING FATALITIES 2015) – Each leaves a grieving network of friends and family. Over 26,000 cyclists were killed or seriously injured across England and Wales between 2006 and 2013. The UK Government must take urgent action to improve safety for cyclists and reduce road danger. We need Dutch style infrastructure, with well designed, safe, segregated cycle lanes, now. Safety improvements to improve the ability of lorry drivers to see cyclists and pedestrians, which will be required under EU law from 2022, must also be made mandatory immediately. The Dutch government spends £28 per person on cycling infrastructure, compared to our paltry £2. To bring ourselves up to their standards we need to spend £40 per person. Then, the UK would be a safe, attractive place to cycle, with all the health and environmental benefits that would bring, but most importantly to prevent tragedies such as the one we recognize on Monday with our Vigil and Die-In. Stop Killing Cyclists calls on the government to amend the Infrastructure Bill currently before the House to fund appropriate and safe infrastructure for cycling and mandate safety improvements to lorries. 1. Stop Killing Cyclists is the direct action protest group set up in November 2013 after the terrible spate of cyclist killings in London. They arranged the first mass Die-In at TfL HQ where 1,500 cyclists laid down in the road in protest at lack of safety investment in London. 2. Stop Killing Cyclists organised another mass Die-In at Marble Arch in November 2014 which followed a protest march down Oxford Street. For details see: The National Funeral for The Unknown Victim of Traffic Violence. 3. Statistics on the number of people killed or seriously injured (KSI) can be found at each of these government websites: ENGLAND, SCOTLAND, WALES, and NORTHERN IRELAND. I was there at Christmas on the bike, not a nice junction in any direction, and sympathy for those closest to the loss, possibly still to be contacted outside the UK. Lousy junction where the driver of a large vehicle Westbound on Seven Sisters Road has to drive well past the start of the corner radius, and then swing left on a rapidly applied full lock, focussing initially of driving to ‘miss’ the traffic island which will pass to the offside of the vehicle and then check the path of the rear as it cuts over the inside of the swept path. effectively sweeping in an arc centred on the rear axle(s) like a door opening in front of you as you walk along a corridor and slamming into your face. A question which rarely seems to be answered – what points was this journey being made between, and why – purpose, time of day, choice of route… Only by building this knowledge can some clear measures be established on how such a journey, and others like it, can be changed to prevent a repeat event. Demand online full publication of crash investigations do this is in public domain – It has been proven for rail travel – no passnger killed since 2007 deliver this for roads!